The fateful day that Attua learned of his father’s murder by a stranger, he also knew that his dream of continuing his military career had come to an end. His fate would be to run the baths that had supported the family in their small town in the Pyrenees. But his wasn’t the only dream to be frustrated, Cristela’s was ruined along with it. Cristela longed for a life with Attua and a promising future, far from the abuse of her stepfather. A twist in fate meant that honour had to come before the love that had blossomed between them as teenagers. Amid misunderstandings, obligations, envy and passion, low blows and forgiveness, Luz Gabás tells a tale of endurance and loyalty in which love comes first and foremost. This is the story of the beginning of the rise of resorts, a landscape of unparalleled beauty and a love that overcomes every obstacle told in the gripping, impassioned prose of the author of Palmeras en la nieve (Palm Trees in the Snow). 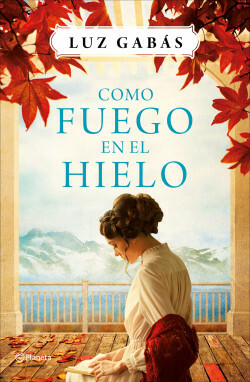 Luz Gabás tells a beautiful story of love and endurance, betrayal and survival, in the incomparable setting of the Pyrenees. After reaching number one in the bestseller lists and rising to the top of the Nielsen rankings with her first novel, Palmeras en la nieve (Palm Trees in the Snow), Luz Gabás has become a very successful author. In this novel, the author returns to the Pyrenees, the thin line that separates Aragon from France, with a beautiful story of love and endurance, betrayal and survival, featuring characters and scenes that will continue to captivate her faithful readers. Wereldbibliotheek (The Netherlands), Muza (Poland).